Click there and you’ll be taken to our sign up page where you can sign up via Facebook or using your email address. Once you click on the button to confirm your secure, private member details you’re good to go. In The Dashboard you’ll find a step-by-step question and answer process. This guides you towards developing your story idea with careful questions, recommended reading, and examples. Each time you complete a step, it is automatically added to the private PDF outline you can download from the main dashboard view while signed into your account. People often struggle to find a “good enough” idea, or have too many ideas. The Now Novel process helps you organize your thoughts to find out your best idea and then develop it. See this page on tools to start writing a book for more information on the first sections. Once you have found the idea you want to work with, we help you profile possible characters, develop your core plot and setting, your entire story’s summary, and outline individual scenes, chapters and story locations. This is where you start to write your novel. You can use the story outline you created in parts one and two to keep you focused on your story. While you write you can chat to other writers in Groups and critique extracts of each other’s work to improve your writing as you go. The critique forum is free to all members (with optional pro feedback if you decide to get a writing coach – read more on coaching below). How long will the writing process take? That unfortunately is determined more by you than by us. If you have plenty of time to write and are focused, you can realistically write a good book in about 6 months from beginning to end. We recommend about 2 months to find out all of the elements of your novel (character, setting, central idea, story type), and then about 4 months to write it as a good timeline. You can of course take longer, we love having you with us. We know if works, but we’re not the best people to ask. You can read many of our reviews on our dedicated reviews blog page which we continue to update: Read our reviews here. Your process seems very set, what if I don’t want to follow it? Feel free to jump straight into giving and receiving writing critiques if you already have a story idea and your novel is underway. Or use a part of the tool (such as the ‘Characters’ section for creating character profiles) in isolation until you have need for others. Is Now Novel a more in-depth outline then the Free Online Templates you can find online? Yes – it’s a process, not just a template, with recommended reading and examples along the way to help you answer any prompt you find confusing. Just click this information icon next to any question for examples. Click or tap it again to hide the examples once more. Our Characters section, for example, walks you through creating a character from motivations to habits, appearance and more. You can also save an image thumbnail representing each character to your outline, for further inspiration. Can I use Now Novel to write other books? 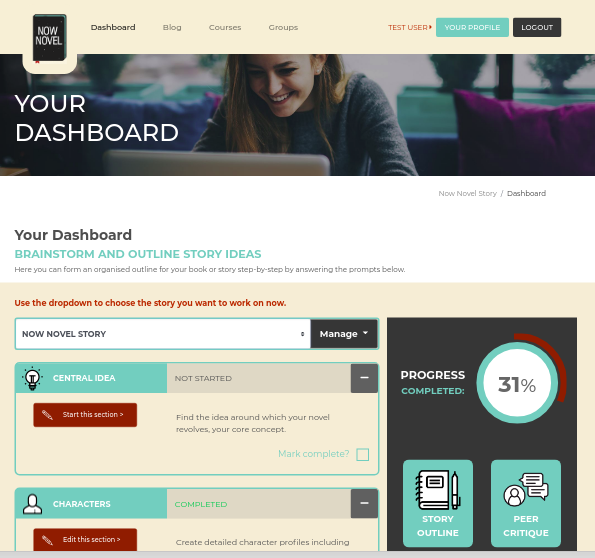 Now Novel is specifically designed to write narrative fiction. Short stories and all fictionalized works fit into this format. Biography and autobiography are more of a stretch, and we don’t recommend trying to write non-fiction using the tool (but if you manage to, please let us know, and we’ll buy you a coffee). I’ve written my book, now what? Congratulations on persevering with your story to this stage! We have a network of professional book editors, publishers’ readers and writing coaches and can help you with each stage of editing, from a manuscript evaluation to proofreading. Request a bespoke manuscript editing quote and learn what to expect from each type of editorial assistance here. If you would prefer to work collaboratively with a writing coach month to month in developing and revising your story and manuscript first, see our author coaching options here. Our Now Novel coaches will lead you through the story-writing process, encouraging you and providing extra motivation. We’ll help you refine your ideas, stay focused and achieve your goals, every step of the way. To find out more, visit our coaching page. We’ll find another coach who is better suited to you. We encourage members to get in touch any time via email at help at now novel dot com with feedback on their coaching experience. Why should I use a Now Novel coach? Focusing on one idea and staying motivated for the duration of writing a large-format project such as a novel, screenplay or other type of story is hard. Your coach is like your personal writing therapist, on hand to talk through whatever you need to deal with to get you to the next stage of your novel. They also provide accountability: because you know you’re meeting your coach, you’ll be sure to do your homework on time! What exactly does the coaching process look like? Once you sign up for a Now Novel coach, we ask two simple questions about your progress, objectives and challenges. We use this information to pair you with the coach likely to be the best fit. We then introduce you to your coach who will assist you as you proceed, tailoring their help to your progress and challenges. You’ll have regular email check-ups with your coach to discuss anything that is bothering you. You can find more information about what’s included in each of our core author coaching plans, ‘Coaching’ and ‘Coaching+’, here. How helpful is it to have a coach? Having a coach guide you through the novel-writing process is enormously helpful – it ensures that you won’t just quit this project mid-way, and will actually follow through and finish your novel. A coach can also help you with writing problems you’ve had for years – do your characters seem a bit too sweet or too stereotypical? Do you quit your idea once you’ve written three chapters? Are you not quite sure how to cram all your ideas into one book? A coach can help you with these problems and more, guiding you to solutions that really work. It is, quite simply, the easy way to write your novel with accountability and guidance every step of the way. 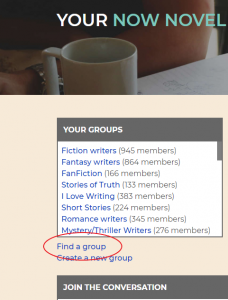 Now Novel Groups is the members-only part of the site where you can connect with other writers, critique each other’s work and chat. There isn’t a group on my favourite genre/subject. What do I do? Create a group – it’s easy. Simply click the link below ‘find a group’ on the main Groups page (‘Create a new group’), fill in the title and description and submit and you’re done. Remember to share your new group on social media and tell your writing friends where to join you. If you create a group, please be a good admin and respond to other members’ messages and threads in a supportive, encouraging manner. How do I share my writing with my group? Every time you share a piece of your work in Groups , a link to your submissions will appear in the live feed of the groups with the label ‘critique submission’. If you have saved existing private extracts you’d like to submit for feedback, you’ll find them listed under the heading ‘Your Scribbles’. Otherwise, create a new one by clicking ‘Create a new scribble’ beneath the ‘Your Scribbles’ box. You will need to have a confirmed account to share or critique others’ work. If the link in your account confirmation email has expired, request a new one by submitting the email address associated with your account here. You can submit one extract up to 800 words long per day for feedback. You can get longer, pro feedback when you upgrade to our Coaching+ plan or get an editing plan including feedback (manuscript evaluation or developmental editing). You can share writing so that it is linked to your members-only profile or share it anonymously. You own your story. We have no rights to your story, and it is 100% owned by you. You can create extracts to share from the ‘Groups’ page while logged into your account. Only signed in members can see what you’ve chosen to share), and if you unshare an extract you’ve put up for feedback it disappears from the main Groups feed and the feeds of any groups you belong to. If you’re looking for individual feedback on your work, then it’s a good idea to get a Now Novel coach – they will give you input on your writing and on the entire novel-writing process. Find out more about coaching below. Can people view the work I do on Now Novel? Or is it completely private? Only you can see anything you haven’t explicitly chosen to share (such as an extract for feedback). You can also share extracts from your draft anonymously so that your username isn’t attached and the author shows as ‘anonymous’. If you don’t want to share anything you don’t have to (we can’t see anything you write in the story outlining tool). It’s entirely up to you whether you use the free writing critique forum for constructive feedback from other members. How do I export what I’ve written? Go to the button on the right-hand side of your dashboard (when logged in), that says ‘Story Outline’, click on it and you will be able to download a PDF arranging all your story outlining work to date. Your first port of call would be to check through this “FAQ” to see if your query is one of the frequently asked variety. Otherwise drop us a mail on help at nownovel dot com and we’ll get back to you as soon as possible. Help, I can’t access my account! Logging in with the wrong details. If you signed up via Facebook, you will need to click the Facebook button to sign in. Only users who signed up using their email address and a password use these details. Using the wrong email address. Make sure the email address you are entering to log in is the one you signed up with. To find the address you used to sign up, search each of your email inboxes for a welcome email with the subject line ‘Confirm your account to get started.’ The account that received this email is the one you used. If a) applies, try step 2. If b) applies, try step 1. If you haven’t yet confirmed your account, follow the instructions in the email you receive. Forgetting your password. If you’ve forgotten your account password, you can send yourself the password reset email here. If you can’t remember which email address you used to sign up, please do step 2 or get in touch via our help mail. If the above processes fail to get you into your account, it’s possible you manually deleted your account via the profile section or we deleted your account in accordance with our use terms and policies. A smaller possibility is it’s a temporary website glitch/error. Please contact help at now novel dot com for assistance if you still can’t sign in. What emails are you sending me? Now Novel’s online writing courses where you can enroll in a free 5-day email series on a writing craft subject, get a free guide or paid workbook on an aspect of craft, or join a coached online writing course. Groups where you can share your own work for constructive feedback or help other members. Your profile where you can fill in further personal details, change your password, unsubscribe from emails and delete your entire account. Can I work on more than one story outline at once? Enter a title or placeholder for your new story idea in the box beneath the text ‘Add a new story:’ and click ‘Add’. This will now be the active story idea. Remember to use the drop-down where you see your active story’s title to select the idea you want to work on. 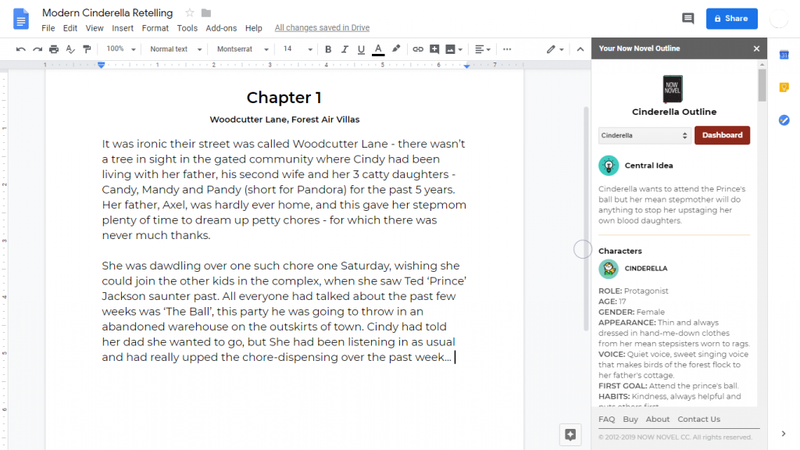 The Google Docs add-on enables you to import your private story outline to your own private documents in the free cloud-based word processing software from Google. You can now view your entire outline alongside your draft in progress, cross-referencing character profiles, plot and setting ideas, chapter and scene summaries from the Scene Builder tool, and all the linked settings you’ve created using the World Builder. Go to the Now Novel Docs add-on in Google’s Chrome store. Click ‘Continue’ on the ‘Let’s get Started’ window to start the app authorization process. Choose the Google account you wish to install the add-on into and sign in (if you are already signed in, you should be directed straight into instructions on how to access your add-on). Allow Now Novel to access your Google Account. (This gives us permission to use external scripts and access the content of the document the add-on is being used in. We don’t read the content of your doc – this is just to allow your doc to display information via the Now Novel Server, securely, using the Now Novel access details you enter). A panel will appear with the Now Novel logo, prompting you to log in using your secure Now Novel username and password. The currently active story outline in your Now Novel dashboard will display alongside your document, for easy cross-reference as you draft. If no story outline is currently active, you will be prompted to log into Now Novel in a separate tab or window and select the story outline you want to work with as the active outline before continuing. Go to https://myaccount.google.com/u/1/permissions (ensure the correct user is logged in). Click on Now Novel to open more details. Note: The next time the add-on is run (from the add-ons menu) it will request authorization again. If you are unable to access/authorize your Now Novel add-on, this is most likely because there are multiple Google Accounts signed in on your system simultaneously. Please ensure all Google accounts other than the one you wish to use with the add-on are signed out first. If I don’t like the process, can I quit? Of course. We recommend getting in touch first to see if we can help you with the process, we will process ASAP from here. What is Now Novel like if I use it free? We know you’re going to love Now Novel, which is why we want to give you a chance to use the process for free. The first section of The Process is entirely free: you can create your central idea. You are also able to create your first character profile from start to finish. You can also choose to have a Now Novel coach guide you through the process – this means you’ll have someone on call to help you develop your novel and, ultimately, finish it. Find out more about coaching below. Why should I pay for Now Novel? We’ve spent a lot of sweat and time, trial and error developing the Now Novel process until it is something that is useful for aspiring writers. We give away a taste of the process so that you have an idea of the value of it. If you decide you don’t want to pay for it, you’re welcome to use the free parts of the site, including our blog consisting of 400+ articles on writing and craft. In addition, if you want a Now Novel writing coach to guide you through the process, you need to pay for their time and expertise. Find out more about coaching below. 2checkout manages our billing for us. They are extremely vigilant in protecting every one of our transactions, and their PCI Level 1 Compliance is the highest level in the industry. This protects you (and us) from online threats. They have an aggressive Fraud Prevention program to keep you protected. Their three tiered protection strategy uses over 300 variables to identify fraud. How would I pay for Now Novel if I do not own a Credit/Debit card? You can use PayPal if you have an account with them. Please note the PayPal option only displays on our checkout page if you have USD or GBP (US Dollar or Great British Pound) selected as your currency. How do I get feedback on my writing? 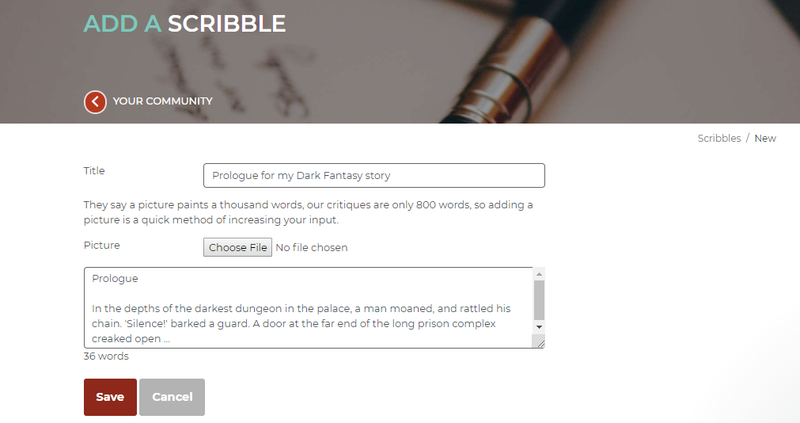 You can submit extracts of your writing to the Now Novel community via your Scribble Pad. You can find out what people think of your characters, your opening sentences, excerpts from your book – or any other feedback that you might like from your writing peers. It’s very simple: You can submit one extract up to 800 words long per day for feedback. Members who opt for pro-critique from a writing coach can get longer pieces critiqued. See the ‘Coaching’ section for further information. 4. On the page you see once you’ve clicked save, click ‘submit for feedback’ and other members will see your new submission in the live feed for Groups and in the Groups you’ve joined. How do I critique other people’s work? On the ‘Groups’ page, scroll down to see the live feed (where it says ‘Join the Conversation’) to see all the latest submissions for critique. You can also see the latest submissions by fellow members of your groups in the group’s separate feed. Click on the title of any submission and it will open and you will be able to read it and leave feedback. Please remember to be polite and give constructive feedback that will help the author improve their work. Where can I see an overview of my critiques and submissions? Your Profile page gives you an overview of the critiques you have submitted and feedback received, as well as scribbles and the number of times you have given feedback. It will also give you the “balance” of outstanding crits that you have. How do I keep my writing private? Not all scribbles need to be submitted for Critique, they can still be used to jot down notes and pieces of a story for your own reference. They do not have to be shared. I’ve finished my novel – now what? Congratulations – finishing a novel is a huge achievement that very few writers accomplish! Once you’ve finished your manuscript, you need to decide what you would like to do with it: do you intend to submit it to traditional publishers, or would you like to self-publish your work? Whichever option you choose, Now Novel can assist you in taking the next step. Whether you self-publish or submit your manuscript to publishing houses, it is vital that you first revise your manuscript with the assistance of a professional editor. There are three different levels of editing: proofreading, copyediting and developmental editing. Now Novel offers a manuscript assessment service, and our professional editors will advise you on which type of editing you need to pursue. We also offer a manuscript critiquing service for authors who would like feedback on their novels, but are not yet ready to commit to a full edit. A manuscript critique will provide you with a report identifying the strengths and weaknesses of your manuscript, together with suggestions for revisions and improvements. If you have questions about the editing or critiquing processes or our services, get in touch. Can you help me to self-publish my book? Yes! For self-publishers, we provide an end-to-end service from editing, print layout, cover design and ebook conversion. We can also advise you on how to get your book onto the large stores like Amazon. Can you help me submit my manuscript to a publisher? Yes and no. While we are not literary or publishing agents and cannot present a manuscript to a publisher on your behalf, we can help you to ensure that your manuscript makes the best impression possible if you wish to submit it to publishers yourself. We offer thorough and professional editing services to assist you in perfecting and polishing your novel, and we can also help you with writing personalised cover letters and manuscript synopses that will make an impact. Please contact us to enquire about our “Publisher Submission Package” if you’re interested in submitting your work to traditional publishing houses. Can you prepare my book for online publishing? Yes! contact us about our self-publishing packages. I want to take advantage of the manuscript assessment service. What do I need to give you? Contact us to find out more about our manuscript assessment service. We will let you know exactly what the process entails, and what we’ll need from you to get started. What is the difference between manuscript evaluations, proofreading, copyediting and developmental editing, and which service do I need? Every author – whether they are a first-time novelist or a bestselling professional – needs a good editor to help polish and perfect their manuscript before it is ready to publish. You can read all about manuscript evaluation, developmental editing, copyediting and proofreading and request a custom quote for the type of manuscript development or polishing you need on our Editing page here. What if I don’t like my editor’s advice? Though the rules of grammar never change, developmental editing is a subjective process. Our editors are highly knowledgeable professionals, but if you disagree with their advice regarding the content or style of your manuscript, you are under no obligation to implement their suggestions. Author feedback is a vital part of the editing process, so if you have questions or problems, we strongly encourage you to discuss them with your editor. In what format should I submit my manuscript to the editor, and what will it look like when I get it back? Your manuscript should be submitted to the editor in MS Word format, preferably formatted to 1.5 line spacing and in one of the default fonts (such as Times New Roman). If you have chosen our developmental or copyediting services, our editor will return the manuscript with tracked changes and comments in the right margin of the Word document, together with a separate report giving more general feedback. The tracked changes in the document will indicate where the editor has made alterations to the text, while the comments will contain suggestions and feedback for the revision process. If you have submitted your novel for a manuscript critique, you will receive a comprehensive report identifying its strengths and weaknesses, together with suggestions for revisions and improvements. A manuscript critique does not include tracked changes or comments on the manuscript itself. The editor has returned my edited manuscript – now what? Revise, perfect and polish! Your editor will provide you with feedback and advice on how best to improve the quality of your manuscript; it is now up to you to implement those suggestions. While fine textual corrections to grammar and spelling will be completed by the editor, your manuscript remains in your control, so any major revisions or rewrites are your responsibility. If you have chosen our developmental or copyediting services, you will usually return your revised manuscript to the editor for a second round of editing. Once you are satisfied with the final revisions, it is your decision to self-publish or to submit the manuscript to a traditional publisher. We offer various packages depending on your budget and needs. Get in touch with us via help at now novel dot com with details regarding your needs for an accurate quote. Why should you create a cover for me when I can get one done for $20 online, or even do it myself? A professionally designed cover can make all the difference in ensuring that your book has a fighting chance in the competitive, saturated market. A good cover will help your book appeal to your identified readers and attract attention for the right reasons (its informative and visually intriguing polish). There are graphics programs like Photoshop that you can use to make your own cover, but cover design goes far beyond just being able to use the programs. Professional designers understand colour schemes, layout and how to align designs to target markets’ tastes and trends. How much does ebook conversion cost? Please get in touch for an up-to-date, industry-informed quote. Can’t I just use a free ebook converter? You can, but ebooks are highly complex files that require customised programming. Free converters can also do strange things to formatting and end up making your book unreadable. At Now Novel, we provide a comprehensive ebook conversion service which includes the coding, testing and validation of your ebook. We also capture and insert your book’s meta-data, which is vital in ensuring that it is indexed correctly in online stores. If a book is incorrectly indexed because of poor or incomplete conversion, your potential readers may not be able to find it. Once the conversion is complete, we also provide you with a test epub and instructions on how to view it so that you can check the conversion for yourself. We can also offer advice on how to upload your book, as well as on pricing strategies. How much do you charge for print layout and typesetting? Please get in touch for our most up-to-date fees. The fee includes a sample chapter layout, so that you can sign off the look and feel of your book, as well as one round of minor text amendments once the typesetting is complete. It is important to bear in mind that typesetting a book for print and converting it to an ebook are two entirely separate processes. Get in touch for more information and we can talk through your options. Can’t I just use Word and typeset my own book? No. Word is simply not designed to be anything more than a Word processor. At Now Novel, we use Adobe InDesign for all of our typesetting projects, which gives us a degree of control over the text which is far superior to what Word can offer. Our typesetters also bring extensive experience in typesetting books to bear on your text so your novel is readable, looks professional and flows correctly. You can also get your books ready for print-on-demand sites such as Lightning Source or CreateSpace using our services. Getting files ready for these sites can be a frustrating process, as they have strict submission requirements which are difficult to conform to using Word.